GPS software- and hardware-maker TomTom slashed prices on its iPhone turn-by-turn navigation app, The Unofficial Apple Weblog (TUAW) reported Monday. The new price for the app providing directions in the U.S. is $49, well down from the original price of $99, as reported by Engadget. The fallout from Google's (GOOG) free turn-by-turn navigation app is clearly being felt by the incumbents -- the same downdraft that pummeled their stock prices the days after the announcement. So expect the price for TomTom's Apple (AAPL) iPhone app to keep heading south. Black Friday deals for GPS devices from TomTom and Garmin (GRMN) were running well below $100 (as compared to closer to $200 two years ago). In fact, TomTom was selling Black Friday doorbuster models for $59, while refurbished high-end GPS devices have dipped below $50 on eBay. This latest price cut is a further signal that TomTom realizes it won't be able to sustain premium pricing for either its standalone or iPhone software products for very long. That's only natural as smart phones continue to absorb any other handheld device that can easily run inside a smart phone footprint. 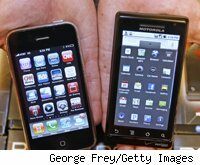 From MP3 players to point-and-shoot digital cameras to GPS units, anything that can fit is going under the hood of phones powered by Apple, Google, Palm (PALM) or Microsoft (MSFT). And it's happening faster than people may think. The quality of cameras inside smart phones is rapidly improving, with many of the new Android-powered models shooting images at 5 megapixel resolution or above. Several regular phones with more internal space for digital cameras offer image resolutions of 12 megapixels and above. Smart phones with HD video are probably only a generation or two away. But the pain of this trend is likely to be most acutely felt in the GPS realm. For starters, there is little brand loyalty to GPS devices and the function they serve is largely interchangeable.Their feature sets aren't rich enough to allow for real brand differentiation; they are just boxes that tell a driver how to get from Point A to Point B and, perhaps, the fastest way to get there considering current traffic conditions. If the box happens to be a smart phone, then it's even more convenient, and it's academic which brand you're using, or which platform the software runs on -- unless you are a company that makes its profits by selling standalone GPS devices. True, Garmin reported a surprisingly strong quarter in its most recent earnings statement. But despite Garmin's attempts to levitate its GPS prices while TomTom aggressively slashes its own, broad public acceptance for premium pricing on GPS devices has been shattered by the one-two punch of the Google navigation app and the memory of dirt-cheap navigational systems on the shelves this Black Friday. In the not-so-distant future, GPS apps will be subsumed as just another commodity feature, so the pain for Garmin and TomTom is probably only beginning.